Five men “in very funny hats” come looking for the biggest, brawniest bull around. Will Ferdinand’s bravery prove intrepid enough to win this weekend’s box-office battle against The Last Jedi or will the mighty (and mightily fey) cartoon bull prove to be no match for the Force? We all know the answer to the question, but given the opportunity, I’d lie like a Trump by telling people that exposure to Star Wars and any of its sequels has been proven to have caused testicular cancer among fanboys. The story is simplicity itself. Published in 1936, the American children’s book The Story of Ferdinand, written by Munro Leaf and illustrated by Robert Lawson, tells the tale of a peaceful bull who is content to laze away the hours in green pastures, savoring the scent of flowers. Unlike his macho, horn-butting contemporaries, Ferdinand has zero interest in making a suicide run against a matador. One day, five men “in very funny hats” come looking for the biggest, brawniest bull around for their upcoming fights in Madrid. A bee sting that sends Ferdinand bucking across the pasture convinces the men that he is the fiercest bull in all of Spain. But on the day of the fight, Ferdinand shows more interest in the señoritass' flowers than he does in facing off against a torero. His persistence eventually earns the bull a permanent place on the flowery knoll. My introduction to the children’s book came courtesy of a high school English teacher who couldn’t get enough of its anti-war message. With no end to the Vietnam conflict in sight, Miss Rosow taught Leaf’s prose as if it were a pacifist primer intended to advise children on how not to follow in the kamikaze footsteps of jingoistic bovines eager to lay down their lives on the field of honor. Others weren’t as convinced about the story’s positive allegorical intentions. After winning the Spanish civil war in 1939, Francisco Franco banned the book, calling it, “pacifist propaganda.” (True to his noble dictatorial leanings, Franco couldn’t deal with the thought of stepping into an arena opposite a bull that didn’t have the guts to put up its dukes.) He wasn’t the only fascist dictator to take exception with Leaf’s simple story of peaceful renewal. Hitler had all copies of the “degenerate democratic propaganda” torched. 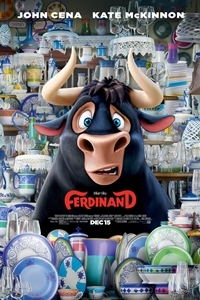 Directed by Twentieth Century Fox Animation’s resident auteur, Carlos Saldanha (Ice Age I–III, Rio I & II), the nicest thing to be said of Ferdinand’s character design is the titular bull looks enough like the Lawson and Disney variations to at least keep one’s eyes pointed in the direction of the screen. The Disney short was released as a stand-alone, not as part of the studio’s fabled series of Silly Symphonies. But given its musical underpinnings and Technicolor fancy, it might just as well have been. Here, however, whatever attention is given to capturing Disney’s lush pastel palette is quickly sabotaged by the busy-as-a-beaver background details once the action shifts to the big city. In a manner reminiscent of the never-duplicated movement of water that Uncle Walt’s crew had a lock on, the animation wunderkinds at Pixar wrote the book on how to bring out the bristly texture of an anthropomorphic pelt. Alas, Ferdinand’s friends appear to be drawn from the same polyvinyl chloride source used to make the toys Fox is hoping won’t last long on store shelves. Ferdinand soon makes a break from his accommodations at the Casa Del Toro. Once in town it’s another bee, another tirade, and in no time word on the street pegs our flower-sniffing protagonist as a cow more lethal than any progressive neurological disorder. Legend has it the mad cow even ate a baby! With 105 minutes to fill — including a dopey third-act car chase that only prolongs the misery — don’t expect to arrive at the bullring until almost an hour-and-a-half into the picture. This leaves the animators ample time to round out the cast with more of their stock, unappealing characters. (This is, after all, the studio that gave us Scrat.) With her lower-mandible overlap and non-stop prattle, Kate McKinnon’s calming goat Lupe needed to find a character voice that wasn’t so reminiscent of Ellen Degeneres’s Dory. And considering the story’s setting, what’s with all the gringo voices? Pro wrestler, actor, rapper, and reality television show host-turned-vocal-artist Jon Cena may have the barrel chest needed to resemble an upright bull, but that doesn’t mean he sounds like one. Excuse me, but wouldn’t Gael Garcia Bernal have been a better choice to voice a Spanish animal? If one must expose children to fables in which testosterone-fueled picadors gets their jollies by stabbing animals to death in the name of sport as thousands look on, there isn’t a better starting and stopping point than Ferdinand. Forgive me, but the only way this drawn-out fable centered on the glorification of brutality could have ended happily is with the bull doing a Mexican hat dance while the matador’s head was still inside his montera. There are some things even Hollywood can’t ruin. SPOILER ALERT: The matador lives, and to the credit of Munro Leaf, so does the bull. Do I regret choosing this over Disney’s Wars for the lead review? Hell, no! It’s a full 45 minutes shorter!